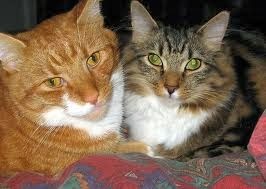 Q: I have 2 male cats that have come down with crystals , what causes them and how do I get rid of them and keep them gone? A: Crystals form when there is an imbalance in the urinary pH. Different types of crystals form depending upon whether the urine is too acidic or too alkaline. A raw frozen diet such as the Primal, Instinct or Stella and Chewy's raw frozen rabbit can promote a neutral pH. Grains and carbohydrates can increase the likelihood of infection in susceptible cats so be sure to use a high protein, high moisture diet that is a hypoallergenic protein source. 1) reduce urinary inflammation-- NotaSAN drops and Akutur drops are very helpful for cats that have multiple urinary tract infections. .
3) clear toxins and sediments from the urinary tract as well as protect the delicate structures of the urinary tract and bladder with Renelix. Retest your kitty's urine to ensure that the proper pH is maintained. We have had excellent results keeping cats free of urinary crystals when the diet and supplement program is used consistently.